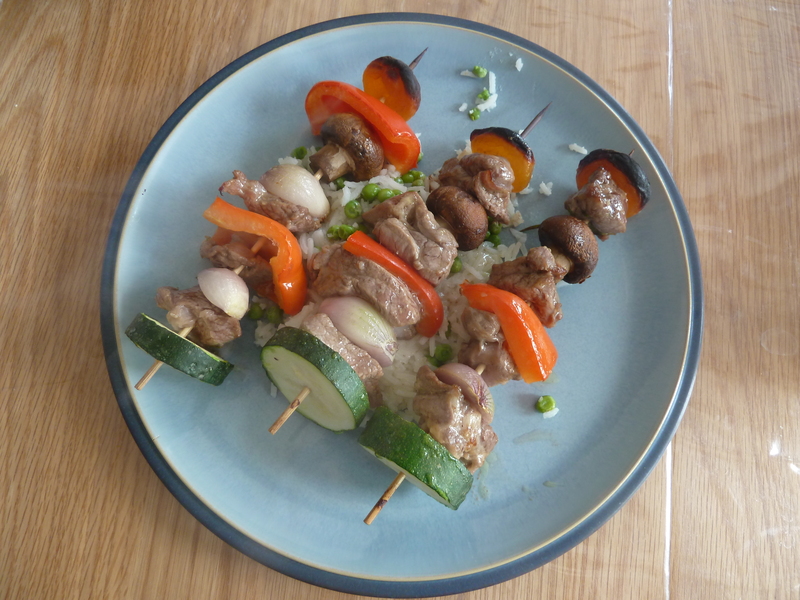 Something I thought it might be nice to try making myself for lunch, these lamb skewers were actually really easy to make. The evening before I mixed together the (really rather tasty) marinade of olive oil, sherry and garlic, cut up the lamb and soaked it in the marinade. 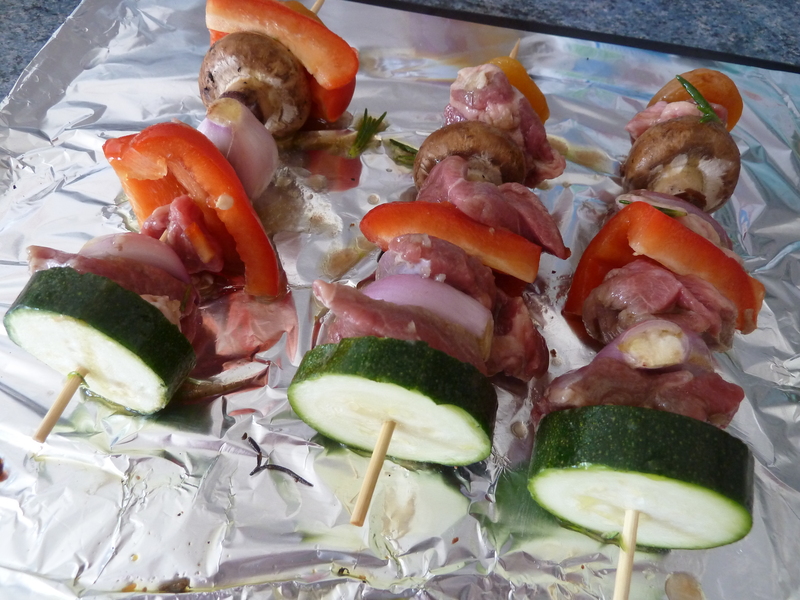 The next day all I needed to do was cut up some pepper and courgette, peel a couple of shallots, and thread all of this (along with some button mushrooms and apricots) onto some skewers, interspersing the vegetables with chunks of marinaded meat. It took ten minutes to cook it all under the grill, and (along with some leftover rice and peas) I had a really tasty, if rather large, lunch ready really rather quickly. This was a recipe I had planned on making before baby J appeared. It didn’t happen, so got forgotten about for a couple of months. However, I was still keen to make it as I thought that both I and the toddler would enjoy eating it. So when I had a spare day, I finally got around to making it for tea. … Because the fun part is making the dish look like a fish before you eat it. Put the rice mixture on one side of the plate, and add a slice cucumber for an eye, with a raisin on top. Then slice up the hard boiled egg and lay the slices out like the scales of a fish. Finally, we added two slices of apple to make the fish look like it had a fin. Looks good, and doesn’t taste too bad (although not incredibly exciting). The toddler and I both ate it fairly happily! By rice and peas, I mean risotto – but a fairly basic risotto. I found this recipe whilst going through my cookbooks looking for things to make at Christmas, and thought it might be something that my two-year old son would like (note: his favourite foods are peas and noodles). 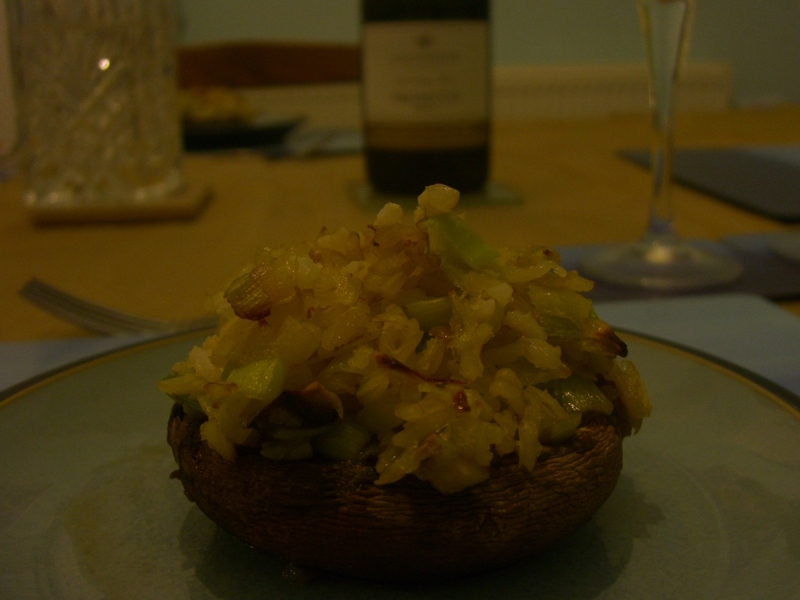 As I said, this is basically a risotto (and I still have no photos, sorry). It basically contains pancetta, rice, white wine, peas, and chicken stock, so it’s not too complex. 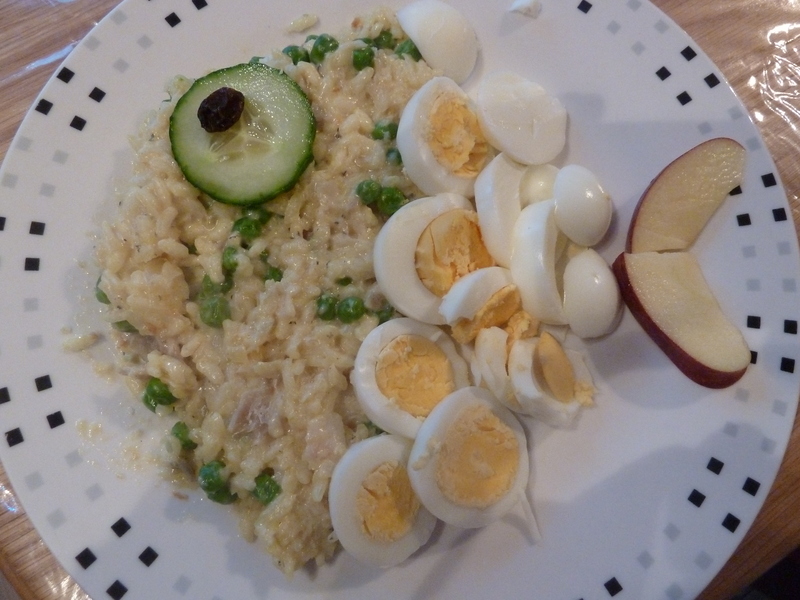 I cooked the meal for both of us for lunch, and whilst I thought it was OK (although a little bland – we tend to spice our risottos up a fair bit), after a short while my son thought it was amazing, and started to request it for at least every other meal. I’m not that enthusiastic about cooking risotto. Maybe it was the wine…?